I bought this bracelet for my son as a birthday gift and he loved it ,and it was a very good looking piece ! Great price as well, and it has never turned even though it was gold plated. 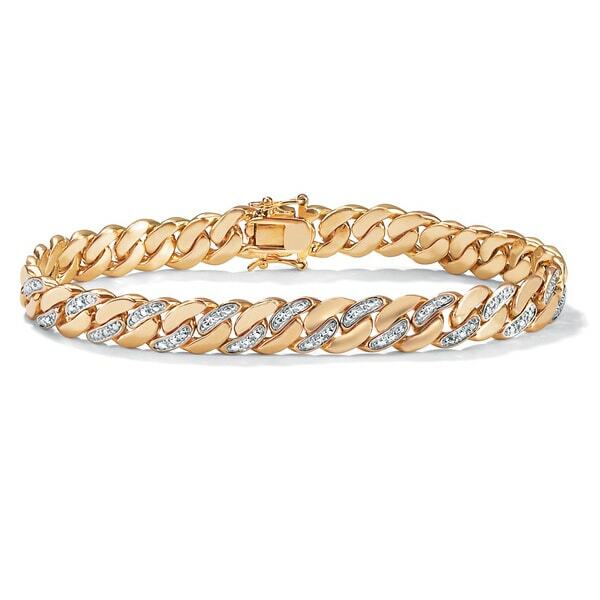 Men's Yellow Gold-Plated Curb-Link Bracelet (9mm), Genuine Diamond Accent 8.5"
Showcase your sophisticated style with this appealing gold curb link bracelet from Palm Beach Jewelry. With 1/10 carat of exquisite diamonds and a high-polish gold overlay, the bracelet exudes an eye-catching elegance. The box clasp with two latches ensures a secure and comfortable fit. All weights and measurements are approximate and may vary slightly from the listed information. *T.W. (total weight) may vary and is a minimum of 0.005 carat. Treatment code N (Diamond White). See Treatment Guide for further information. This is a very well-thought out piece of men's jewelry. It catches attention without being gaudy.. The catch is very secure. I am proud to wear such a beautiful piece of "bling". I have had many sincere compliments on this piece. This was a gift from me to me. I wanted a bracelet to wear to replace the one in which I had lost. This one had a particular classy look to it. I get a lot of compliments on it. I know that this is not one of the selling features but, I do a like of moving around of my arms (studio drummer). On a few times, the bracelet has flipped to it's back side. The look, the gold, wow. I've had other musicians tease me that they knew where my royalty checks were going, to pay off the gold on his wrist. If they only knew. Sorry to ramble, this was a great purchase for me and for you also. your dealling with athird party!!! Before buying jewelry from Overstock make sure it's not coming from "***" or they will rip you off. Beware of this company!!! Diamonds look better in the pictures than in person but does have a nice shine and I receive many compliments. However if you wear it often it develops a green tarnish in between the links so I would recommend cleaning it with a jewelry cloth after each wear. The green tarnish wipes right away and only develops if you don’t clean the bracelet. Pretty happy with the piece for the price, the diamonds aren't much for diamonds but you get what expect for the price, I do get many compliments on it! Good for the price! GREAT for a man or a woman. I have purchased many pieces of jewelry from OS in the past years and I have to say this is the best value for the dollar I can remember. The quality is great. Its a beautiful bracelet for a lady and a very sharp looking bracelet for a man. I bought it at a discount price that made it an even greater buy. Liked it so much, I bought one for my best friend who always made a remark as to how sharp the bracelet looked. Bought this bracelet for my son ... for Christmas ... He Loved it! So did I! Great Service as well! Will certainly shop here on a regular basis! My husband loved this. The clasp was a little stiff when he first tried it, but it loosened up after wearing it a few times. I bought this bracelet for my husband and he is in love with it. In fact he does want to take it off. It looks better in person. Would recommend it to others. It’s heavy and it’s beautiful Overstock has nice jewelry. I love the way they design and it's has combination of dressing. This IS JUNK jewelry, at its finest! Looks and wear beautiful and is still going. There is no wow in this product. It seemed very cheap looking. Beautiful bracelet. My wife loves to wear it. "is this gold plated or gold overlay ? i think read ad the description says gold overlay so in this case i think in the USA items that are GOLD overlate need to be stamped so is this stamped with 18k GO ? i see the title of the item says plated but in the description of the add it says overlay also what is the material of the metal under the gold ?" This item has a base metal of brass with a layer of 18k gold plating. This item is not stamped 18k gold. "What is the size 8.5 inches?" Measurements are 9 mm wide x 8.5 inches long. "Does this come in a cushioned box? I'd like to purchase this as a gift for someone. It would be disappointing to receive this in a bag. " Our items do arrive in a Palm Beach Jewelry jewelry box. "Is it has a stamp?" No, as it is not solid 18K gold, it is not stamped. "do you have this product in 7 inches? or 7.5 inches?" At this time we do not offer this bracelet in any additional sizes. "Are the diamonds real or CZ?" Hello TMBOOMIN, this lovely bracelet is made with genuine diamonds. Thank you for shopping with us.